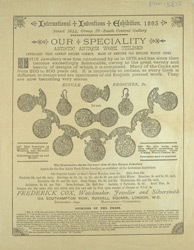 This is an advertisement for 'Frederick Cox, jewellery seller'. 19th century jewellery is marked for its variety and wide range of materials used. Jewellery was often bold and overstated, with many precious stones and gems adorning broaches, hairpieces, hatpins, necklaces, bracelets, rings and watches. Designers made use of materials not previously available like coral, turquoise, exotic shells and porcelain. As jewellery was so expensive it was important that pieces could be fixed if they were broken so proprietors like Frederick Cox would have been very popular.